Arena HD OB truck control room. “There are two major issues facing us this year,” David Cohen, vp of marketing communications at Grass Valley, told me during our interview. “The first of them is the migration to IP production thanks to the approval of an open SMPTE standard, ST 2110, which was spearheaded by Grass Valley and about 100 of our closest competitors who got together to form AIMS (Alliance for IP Media Solutions). Even while they were waiting for this kind of a standard to be ratified, Grass Valley and their friends at SAM (Snell Advanced Media) which became part of the Belden Brands’ Grass Valley in February, 2018, were able to get ready for this move to IP because they already had more than 65 installations based on COTS (Common Off-the-Shelf) IP switches from multiple providers. Of course, for some who’ve who have been reading color bars since before their hair was the shade of the 11.5 IRE pluge pulse, this can raise red flags. We all remember that there was a time when going to a single vendor meant a facility could find itself locked into proprietary technology. The second tech horizon we can look forward to at the NAB Show 2019 is the result of merging SAM and Grass Valley technologies in their post-production systems. Grass Valley created a new user interface for Morpheus called Morpheus UX. This can most clearly be seen in all five of Grass Valley’s production switchers and playout product lines such as ICE channel-in-a-box, and in their playout offering including Morpheus software-based user-defined panels and ITX. 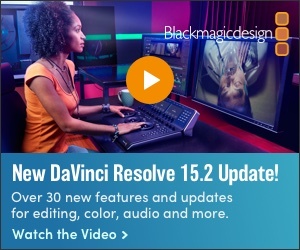 Of course, it’s the edit systems I am most interested in now that Grass Valley has both EDIUS and Rio under its banner. With that surfeit of editing riches, it’s only natural to ask how their development paths are going to differ. To make an overly broad generalization, it is not unfair to think of the Rio toolset to be optimized for film work which EDIUS fits very comfortably in the newsroom. After all, because Rio can interface with Grass Valley’s mobile editing app, Go!, through Python scripts, it is hard to typecast. So should we look forward to in the Grass Valley exhibit at The NAB Show 2019? They include under that “remote” concept the idea of at-home production systems. 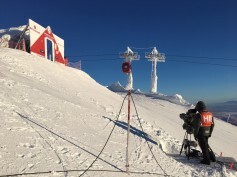 A Grass Valley LDX-86 camera Direct IP on remote at the 2019 FIS Alpine World Skiing championship. Actually, Cohen told me that although a lot of people are buying 4K cameras, many consider the sweet spot as 1080P HDR. “It fits right into the current bandwidth, the current infrastructure, and looks just great on home 4K screens,”, said Cohen.